Sun Moon Lake did very little for me during a short visit last year. Its campground should probably be relocated, a cable car ride to the mountain above the lake wasn’t an option due to crappy weather, I’m not really enticed by butterfly gardens and frilly mountain-top theme parks are, well, creepy. Swimming is not permitted (aside from the annual 10,000 People Sun Moon Lake Traverse) so many visitors opt to take a boat tour or hit up the lakeside hiking/biking trails. Take a grilled chicken wing, get rid of the bones, jam pack it with seasoned sticky rice, garnish with scallions and red onions and sell it for $NT 60 (not even two bucks). I’ve since run into these rice stuffed wings (饭饭鸡翅) at night markets around Taiwan, but none have held up to the standard found in Itashao village. Probably because the stall in Itashao uses proper sticky rice (a favorite among Taiwan’s aboriginals) whereas other places use white rice. 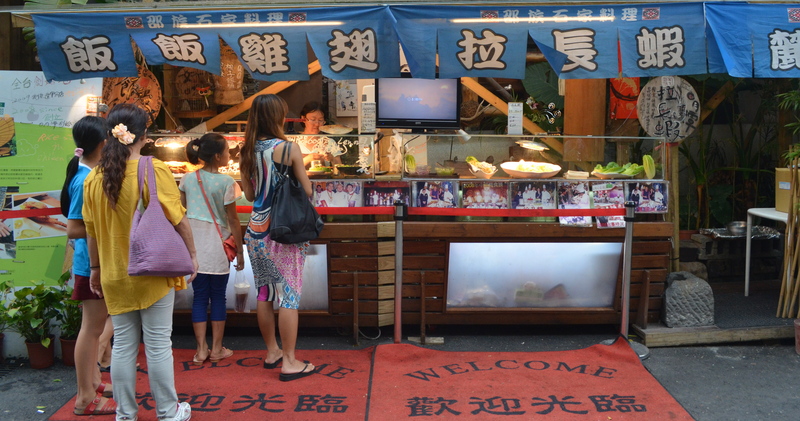 There wasn’t much of a line when when we visited, but a row of photos in front of the stall suggests that whoever is involved with this version of the dish is a big deal. Find the stall on the main road heading towards the pier in Itashao village, among the other food stalls and knick-knack shops. This entry was posted in Food, Travel and tagged cheap food, Chicken, Food, Food Stalls, Good Eats, Itashao Village, Kickerjean, Shueishe Village, sticky rice, Sun Moon Lake, Taiwan, Travel by Jay Woodson. Bookmark the permalink. Never heard of this, but it looks succulent!!! I lived by China town in San Francisco and wish I had known about this dish then… Very nice post!! Thanks for stopping by. When I saw it, my mind was blown. I’ve thought about trying to replicate it, but don’t know that I have the skills to pull it off. It would be interesting to look up the origins of the dish. Yup it’s nice. I tried the one with kimchi in Shifen. There’s one with Kimchi? I must try it! yup. you should. =) I felt that it was much better than the one with stuffed rice.